The work of the NCJFCJ has several initiatives and programs so that judges in their communities can oversee positive outcomes in child welfare matters. 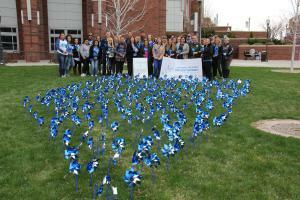 RENO, NV, USA, April 5, 2019 /EINPresswire.com/ -- (Reno, Nev.) – The National Council of Juvenile and Family Court Judges (NCJFCJ) recently convened with the northern Nevada community at the University of Nevada, Reno for National Child Abuse Prevention Month. To raise awareness for this important issue that affects our most vulnerable population, the NCJFCJ, the University of Nevada, Reno, the Associated Students of the University of Nevada, Reno (ASUN) and the Washoe CASA (Court Appointed Special Advocates) Foundation planted a Nevada-shaped garden of blue pinwheels – displaying Nevada's commitment to support children affected by abuse and neglect. Washoe County Sheriff Darin Baalam, and members of Prevent Child Abuse Nevada, the Department of Health and Family Services, Nevada Wolf Pack Cheer and B.A.C.A. (Bikers Against Child Abuse) were also in attendance. In 1983, April was declared National Child Abuse Prevention Month by a Presidential proclamation. It is an opportunity to highlight a system of care for those children victimized and traumatized by abuse. It allows people to pause from daily routines and acknowledge participants in the child welfare system who are committed to promoting the social development and well-being of children and families. In 2008, Prevent Child Abuse America introduced the pinwheel as the national symbol for child abuse prevention through Pinwheels for Prevention®. The pinwheel connotes whimsy and childlike notions. In essence, it has come to serve as the physical embodiment, or reminder, of the great childhoods we want for all children. Today, approximately 800 abused and neglected children live in foster care in Washoe County because they cannot live safely at home. Each year more than 400,000 abused and neglected children experience foster care in the United States. The work of the NCJFCJ has several initiatives and programs so that judges in their communities can oversee positive outcomes in child welfare matters. The Child Abuse and Neglect Institute, created in 1996, provides training in dependency court best practices for judicial officers. This week-long program brings together national and local faculty to teach on core topics including hearing practice, child development, substance abuse, and cutting-edge court improvement developments, among other topics. The NCJFCJ’s Enhanced Resource Guidelines serves as the national blueprint for education and training on child abuse and neglect practices. The Enhanced Resource Guidelines covers all stages of the court process, from the preliminary protective hearing until juvenile and family court involvement has ended, which leads to the child safely being returned home or placed in a new, secure and legally permanent home. Recently, the NCJFCJ added eight new court sites to apply practices from the Enhanced Resource Guidelines for a total of 24 sites nationwide, through the NCJFCJ’s Implementation Sites Project, which fulfills the goal of improving the outcomes for children in care. These Implementation sites are part of a 20-year history of the NCJFCJ’s work beginning with the original Resource Guidelines and the Model Courts Project, which took a critical look at improving court practice for children in care and their families across the country. To learn more about the National Council of Juvenile and Family Court Judges, visit ncjfcj.org.